in use today have high short-term radon levels. 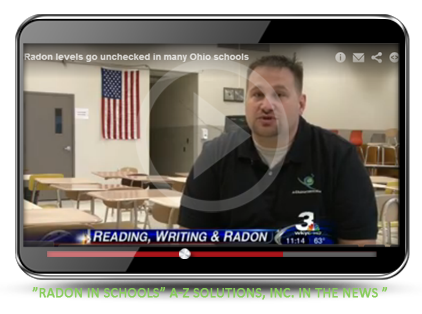 For over a decade A-Z Solutions, Inc. has worked on radon testing and mitigation for schools. See if your school has been tested for radon. What is radon you ask? Radon is a naturally occurring gas that seeps into buildings substrate and through its foundation. As it enters the building it becomes integrated into the breathable air, putting anyone in the building at risk. In some cases, well water may be a source of radon. Overtime, this exposure can cause radon induced lung cancer. The only way to know if you are at risk is to have a test conducted by a professional. EPA’s national survey of schools produced some alarming results about concentrations in our children’s classrooms. “Public awareness must be raised about the hazards of radon to hasten efforts to reduce the danger. All schools must be tested to determine if there is a problem, and schools must inform parents of the results. We cannot ignore this problem.” Kathryn Whitfill, National PTA President. The EPA ranks indoor radon among the most serious environmental health problems facing us today. After smoking, it is the leading cause of lung cancer in the United States causing an estimated fourteen-thousand (14,000) lung cancer deaths a year. Children are even more susceptible to the effects of radon gas due to their developing lungs. A great deal of their time is spent in classrooms and should therefore be tested to insure the air they are breathing is safe. The only way to determine if a problem exists is to test for it. Having your school tested for radon is something you may want to discuss with your school officials. Because as real as the threat of radon is, the good news is that the problem can be solved. A professionally installed radon mitigation system can reduce your child’s daily exposure to radon gas. – Keith Geiger, NEA President.